Why Add Subscribe to Authors in WordPress? The largest blogs with multiple authors allow users to follow their favorite authors. You can suggest this feature on your site with several WordPress authors. 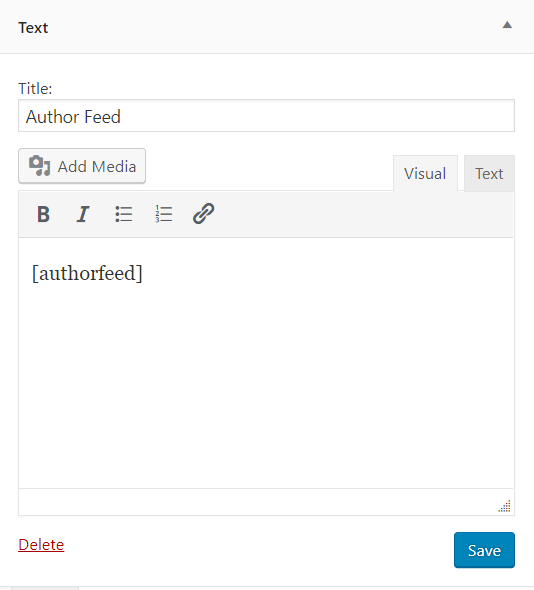 WordPress generates RSS feeds for all authors, categories, tags, custom message types and comments on your site. However, your users can not see these channels without knowing where to look. You just need to add links and subscription options so that users can subscribe to the authors. Let's see how to allow users to easily subscribe to authors in WordPress. Don’t forget to replace ‘john’ with an existing author’s name on your site. Many WordPress themes come with a section that displays author’s biographical information at the end of the article. You can add this HTML code in an author’s bio section to display a link to their RSS feed. You can also automatically generate the link and use a shortcode to manually insert it into posts. First you need to add this code to your theme’s "functions.php" file. You can now just use the shortcode [authorfeed] in your posts, and it will automatically generate a link to the post author’s RSS feed. Feel free to customize the text you want to display for the link. We will be using the shortcode method to display a subscribe to author link in the sidebar of your WordPress blog. Simply go to "Appearance" » "Widgets" page and add a text widget to your sidebar. You will need to add [authorfeed] shortcode in the text area of the widget. After that, don’t forget to click on the save button to store widget settings. You can now visit your website to see the sidebar in action. The problem with this method is that it will display the widget on every page including the homepage, category, and tag archives, etc. We hope this article helped you learn how to allow users to subscribe to authors in WordPress.